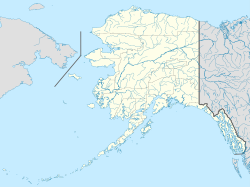 Nuiqsut (Inupiaq: Nuiqsat, IPA: [nuiχsɐt] is a city in North Slope Borough, Alaska, United States. The population was 433 at the 2000 census and 402 as of the 2010 census. Nuiqsut is located at 70°12′59″N 151°0′21″W﻿ / ﻿70.21639°N 151.00583°W﻿ / 70.21639; -151.00583 (70.216338, -151.005725). Nuiqsut is in the North Slope Borough on the Nechelik Channel, about 35 miles (56 km) from the Beaufort Sea coast. According to the United States Census Bureau, the city has a total area of 9.2 square miles (24 km2), all of it land. Air travel to the Nuiqsut Airport provides the only year-round access to Nuiqsut. Nuiqsut is accessible during the winter via an ice road and was featured in season four episode one of the History television channel series Ice Road Truckers, when a convoy of truckers delivered supplies to the village. A road is being built to connect Nuiqsut to the road system, through Conoco Phillips Alpine Oil reserve. Nuiqsut first appeared on the 1980 U.S. Census as an incorporated city, having incorporated in 1975. As of the 2010 United States Census, there were 402 people residing in the city. The racial makeup of the city was 87.1% Native American, 10.0% White, 0.2% Black and 2.7% from two or more races. As of the census of 2000, there were 433 people, 110 households, and 90 families residing in the city. The population density was 47.0 people per square mile (18.2/km²). There were 126 housing units at an average density of 13.7 per square mile (5.3/km²). The racial makeup of the city was 10.16% White, 0.23% Black or African American, 88.22% Native American, 0.46% Asian, and 0.92% from two or more races. Hispanic or Latino of any race were 0.23% of the population. There were 110 households out of which 54.5% had children under the age of 18 living with them, 42.7% were married couples living together, 22.7% had a female householder with no husband present, and 17.3% were non-families. 15.5% of all households were made up of individuals and 0.9% had someone living alone who was 65 years of age or older. The average household size was 3.93 and the average family size was 4.24. In the city, the population was spread out with 42.0% under 18, 9.5% from 18 to 24, 30.5% from 25 to 44, 13.6% from 45 to 64, and 4.4% who were 65 or older. The median age was 24 years. For every 100 females, there were 147.4 males. For every 100 females age 18 and over, there were 130.3 males. The median income for a household in the city was $48,036, and the median income for a family was $46,875. Males had a median income of $31,667 versus $25,625 for females. The per capita income for the city was $14,876. About 3.2% of families and 2.4% of the population were below the poverty line, including 1.1% of those under age 18 and none of those age 65 or over. There is one commercial store in Nuiqsut, one mail receiving location (operated by the City of Nuiqsut not the United States Postal Service), and one church (Presbyterian). Other areas of social activity include the city recreation center and the school. An elder's living center is also present. There is one school in Nuiqsut for grades kindergarten through 12th grade, Niquisut Trapper School of the North Slope Borough School District. The school also provides preschool. There are approximately 100 students. There are approximately 12 teachers and 6 other staff members. Many community functions are held in the school and it serves as social center as well as school. The school facilities also serve as an emergency shelter for the community in times of power outages. The native people of the village are Inupiat. The village was re-established in the early 1970s when the residents moved to the region from Utqiagvik. For one year they lived in tents while housing was built. These original residents were the first to receive dividends from the oil companies in exchange for land use. The dividends are passed from the original shareholders on to the community member of their choice (often parent to child). Native traditions such as hunting (whale, caribou, fox, ptarmigan, etc.) and the making of native clothes and crafts continues, although the influence of modern society has reduced both need and interest in these activities to some degree. The traditional whale hunted by the whalers of Nuiqsut is the bowhead whale. Nuiqsut is located in the midst of a vast quantity of oil. Many major oil companies have oil facilities in the region (ConocoPhillips, BP, etc.). The relationship with the community of Nuiqsut is such that the oil company using the land, considered to be the property of the native Nuiqsut residents (Inupiat Eskimos), pay dividends to residents in exchange for use of the land. For many native residents the dividends are the primary, or only, source of income. ^ 1996 Alaska Municipal Officials Directory. Juneau: Alaska Municipal League/Alaska Department of Community and Regional Affairs. January 1996. p. 110. ^ 2015 Alaska Municipal Officials Directory. Juneau: Alaska Municipal League. 2015. p. 116. ^ a b c "Nuiqsut city, Alaska". Profile of General Population and Housing Characteristics: 2010 Demographic Profile Data. United States Census Bureau. Retrieved January 23, 2013. ^ "Nuiqsuit." North Slope Borough School District. Retrieved on February 14, 2017. This page was last edited on 6 April 2019, at 15:32 (UTC).